EFF, joined by Public Knowledge, filed an amicus brief today asking the Court of Appeals for the Federal Circuit to revisit one of its worst decisions ever. Three years ago this month, in Oracle v. Google, the Federal Circuit held that the Java Application Programming Interfaces (APIs) could be copyrighted. APIs are, generally speaking, specifications that allow computer programs to communicate with each other and with human users, and are different than the code that implements a program. The Federal Circuit’s decision was every bit as bad as some of its oft-criticized patent law decisions. 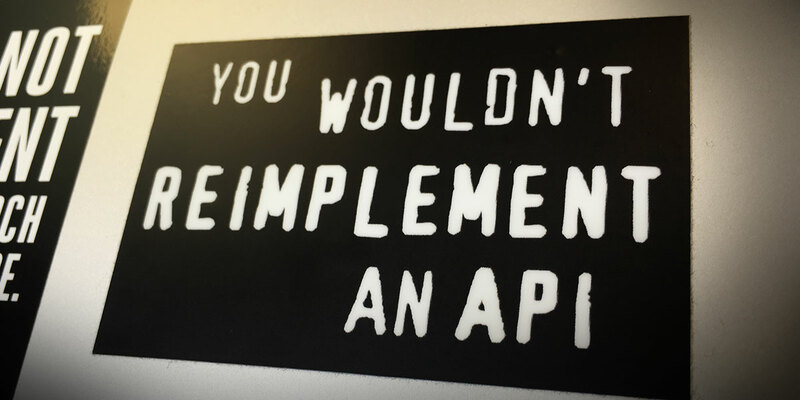 Treating APIs as copyrightable has a profound negative impact on interoperability and innovation. And it goes against decades of tradition and common practice in the software world. Fortunately for technologists and innovation, the U.S. Court of Appeals for the Ninth Circuit issued a significant ruling that undermines the Federal Circuit’s decision about whether processes and methods of operation like APIs can be copyrighted. In a case about Bikram yoga poses, the Ninth Circuit applied a section of the Copyright Act that forbids copyright protection of ideas, processes, systems, and similar concepts. The court said that a “sequence” of 26 yoga poses and two breathing exercises, performed in a particular order, was not subject to copyright protection. If a system of yoga poses isn’t copyrightable, then a system of APIs for operating a computer program definitely isn’t. In reviewing Oracle v. Google, the Federal Circuit was supposed to apply the laws of the place where the case was tried: California, which is in the Ninth Circuit. But it didn’t—the court disregarded both Ninth Circuit copyright law holding that APIs aren’t copyrightable, as well as law from other circuits. This is wrong and, if not corrected, will have devastating consequences for innovation. The freedom to reimplement and extend existing APIs has been crucial to competition and progress in both hardware and software. Simply put, excluding APIs from copyright has been essential to the development of modern computers and the Internet. EFF isn’t alone in sounding the alarm about the Federal Circuit’s decision. Other commentators have harshly criticized the Federal Circuit’s decision for its misunderstanding of both computer science and copyright law. It’s confounding how the case got to this point in the first place. The Federal Circuit usually doesn’t hear copyright appeals. However, it heard Oracle v. Google because of a quirk in federal appellate procedure rules. Oracle had originally sued Google for both patent infringement and copyright infringement, but a jury found the patents were not infringed and the trial judge ruled that the APIs were not copyrightable. Even though Oracle didn’t appeal its trial court loss on its patents, its appeal of the copyright ruling went to the Federal Circuit, which hears all patent appeals. After the Federal Circuit reversed the trial judge, Oracle v. Google returned to the district court last year for a trial on Google’s fair use defense. The jury unanimously found that Google’s use of the Java APIs was a lawful fair use. Oracle again appealed to the Federal Circuit. EFF’s amicus brief (filed along with Public Knowledge) asks the court to reject Oracle’s latest appeal. EFF first asks the court to revisit its previous 2014 decision in view of the 2015 Ninth Circuit opinion, and hold that the Java APIs aren’t copyrightable. This will fix at least some of the harms caused by the Federal Circuit’s opinion. And if the court isn’t willing to reverse its earlier decision, we also explain why the jury’s fair use verdict was proper. Fair use should permit copying of functional computer elements and their expression for purposes of efficiency, compatibility, or industry demands. It’s no understatement to say that much hangs on the Federal Circuit’s decision to follow the rules and apply Ninth Circuit law, and uphold the fair use ruling. Innovation, healthy competition and, ultimately, more and better technology choices for users all hang in the balance.